Recorded on December 15, 2013. Kyoufu Densetsu Kaiki! 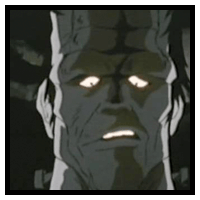 Frankenstein, is a 1981 Japanese animated television film based on Mary Shelly’s novel and the Marvel comic book The Monster of Frankenstein. Ha! That song is about a Nazi Frankenstein Monster Soldier! Basically an autobiography.